Last week I had a chance to listen to an inspiring panel of Armenian Women in Leadership. All the speakers were great inspiration: self-made success stories, mothers, wives, captivating speakers and leaders of the community. Instead of asking the beaten question "Evaluate your [success/looks/happiness/...] on scale 1 to 10, one of the panelists proposed an alternative question: "Evaluate the cards you have been dealt from scale 1 to 10 and what you have done with those cards". Everyone had different ideas, and this is more of a philosophical question, since cards you have been dealt made you who you are. I keep reiterating this question, trying to find answer to it for myself. It is easier to evaluate what I have done with cards I have been dealt (8/10) than what cards I got. I am still looking for the answer to the question about the cards. How about you? 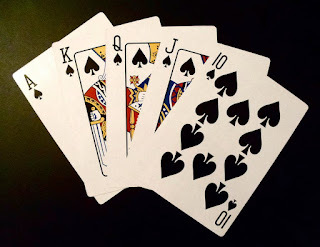 What cards have you been dealt and what did you do with them?